“Every question asked in reverence is the start of a journey towards God. When faith suppresses questions, it dies. When it accepts superficial answers, it begins to wither. 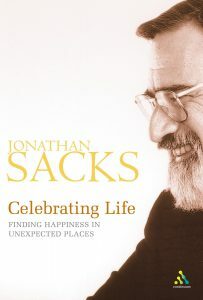 Rabbi Sacks asks questions and explores depths of meaning in the simple day-to-day happenings and interchanges of life. Please Note: Add your comment and you stand a chance to win your choice of a copy of one of Rabbi Sacks’ books featured this Summer. Love to read the profound thoughts of Jonathan Sacks. Judaism is teaching me to be grateful especially when I first wake up and not to take things, especially life for granted. So true, George! Thank you for your comment. How sad, but I have to admit, I so very often forget to be grateful for the very breath of G-d. Thank you for sharing this treasure with us.